IP Result of anti-ANT1/2 (IP:15997-1-AP, 4ug; Detection:15997-1-AP 1:500) with mouse heart tissue lysate 4000ug. Adenine nucleotide translocators (ANTs) are mitochondrial carrier proteins that exchange ATP and ADP between the cytoplasm and the mitochondrial matrix. Four isoforms of ANT were identified: ANT1 (encoded by SLC25A4) is highly expressed in different tissues; ANT2 (encoded by SLC25A5) is predominantly expressed in proliferating, regenerating, or undifferentiated cells; ANT3 is ubiquitously expressed; ANT4 is mainly expressed in testis and germ cells. 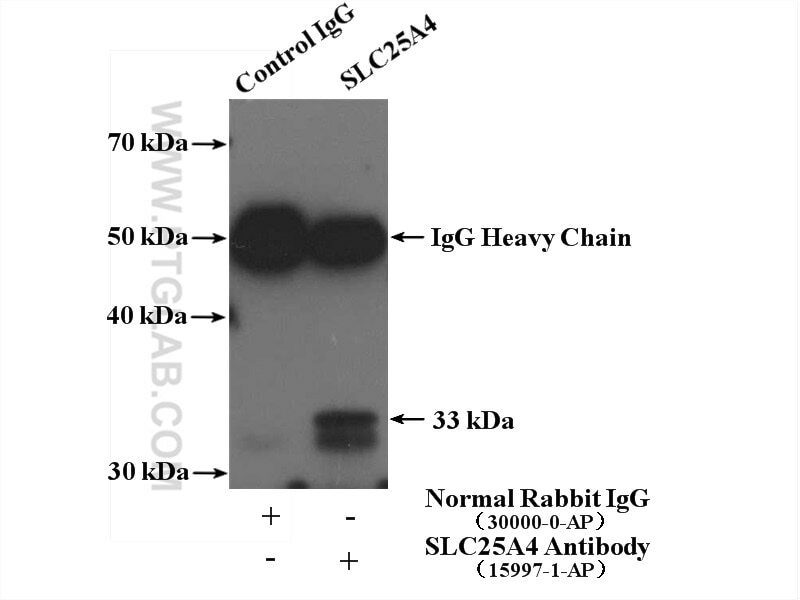 This antibody recognizes both of ANT1 and ANT2. Curcumin prevents mitochondrial dysfunction in the brain of the senescence-accelerated mouse-prone 8. Regulation of DNA demethylation by the XPC DNA repair complex in somatic and pluripotent stem cells.